Imagine the (now nearly emptied) Calais “jungle” and mental healthcare services in one single sentence: your reaction would probably sound like “you wouldn’t know where to start”, for you are just a single person and Sisyphus was never your favourite character in epic poetry. But someone might decide to try, in spite of the hopelessness of the situation, and create a group who could at least provide some mental healthcare assistance to those who most need it. The Refugee Resilience Collective (RRC) was born on these assumptions. The reality is, the RRC is just one of the countless volunteer groups and organizations that felt the urge to make the Calais “jungle” a little less of an inhumane place. Leaning on the makeshift medical system created by Médecins sans Fontières and Médecins du Monde at the Calais camp, the London-based collective (composed of 9 clinical psychologists and systemic psychotherapists) has been commuting from the British capital every Friday since last April to conduct group therapy with young asylum seekers, women and volunteers working at the Calais camp. Asylum Corner talked to one of the collective’s founders, Cristian Pena. As Cristian explained, their job at the Calais camp mostly consisted of conducting group therapy using a narrative approach which enabled asylum seekers to share their stories of resilience. Targeting mostly minors living at the camp, the group sessions were aimed at “training resilience, rather than diagnosing and healing trauma”, says Cristian. Through the personal narration of one’s life, people can become aware of the moments of distress they have been able to cope with and find further strength to keep going despite the adverse conditions. “The group composition changed of course from week to week” says Cristian “and at the end of every session we all had the feeling that it would be the last one with those specific people, as their intention and hope was to try to reach England as soon as possible”. Many tried but were unsuccessful, and so the following week Cristian and his colleague would meet them again. Beyond working with minors in the unofficial camp, the collective also conducted similar sessions at the official Jules Ferry Camp for women with children and with the population of volunteers working in Calais. Indeed, the very stressful conditions of the “jungle” did not leave the volunteers untouched: many of them went through traumatizing experiences and had a hard time organizing a balanced work plan without running the risk of burning out. 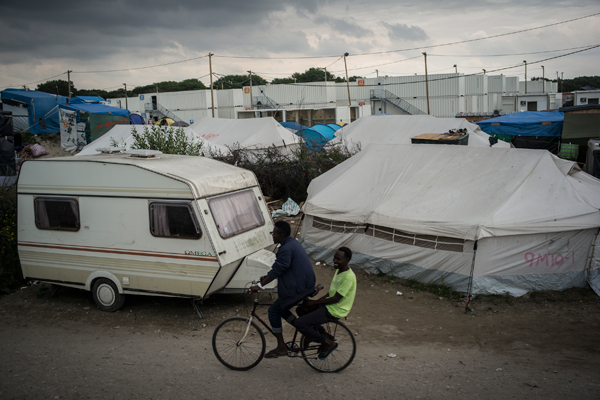 The majority of asylum seekers staying in the Calais “jungle” were finally evicted at the end of October but this change will not halt the collective’s activities with asylum seekers. In other cities, with different people, the Refugee Resilience Collective will go on nurturing asylum seekers resilience and positivity.